What happened to human decency? Though Fatty is convinced that there's plenty of it to go around, I am assured that human decency is lost, perhaps irretrievably. I have little hope of finding it, but if I do, perhaps some of the other stuff I'm missing will be there with it. My certainty regarding the complete and utter absence of human decency was solidified during my road ride today. The smoothest, most luscious and pristine piece of tarmac in the entire valley has been coated with gravel in preparation to become chipseal. This is a grave loss, as this wonderful piece of pavement was just the sort of place where one could fly along (if 23-25 mph is considered flying, and indeed it is to me), seemingly uninhibited by rolling resistance. One could imagine one's self as Mark Cavendish, pulling ahead of the bunch sprint and leaving blow snorting Belgian primadonnas in one's wake. Or perhaps as Dave Zabriskie, in the deepest and most aero of tucks, impervious to the wind, nuts coated and protected from moisture and friction by a high-viscosity embrocation. If this strip of road were somewhere I only occasionally rode, I could perhaps overcome my disappointment. But nay, it is part of at least half of my regular routes. I pronounce myself inconsolable. Were I to die of brokenheartedness, ACHD would have the blame resting squarely on its shoulders. As I search the world diligently for human decency, I am quite certain that if I find it, it will be in a place that I put it, certain that said place would be easy to remember. Along with it would be the batteries that I bought for my heart rate monitor a few weeks ago. I bought new batteries a few weeks ago knowing I would need some soon. But not wanting to use them until I actually needed them, I put them in a place that would be easy for me to remember. If I ever remember where that place is, I am quite confident that I will find many other things there, things which I long ago gave up on ever finding again. Should my current and acute brokenheartedness in fact become a mortal wound, and should the collective humanity desire to prove itself decent, please bury me with the batteries for my heart rate monitor. I don't think of myself as being obsessed with the weather forecast. I never watch the 10:00 news long enough to get to the weather, and my usual weather checking technique is to look out the window and maybe step outside for a few minutes if it might be cold. Except during ski season--then I check the forecast religiously hoping to see storms in the forecast and hoping that they materialize. Today is important because it's the first day on which Lotoja shows up in the 10 day forecast. For the next nine days, I'll be watching weather.com almost as if it's ski season. The forecast right now shows clear weather for the first half of the race, but rain from Star Valley, WY to the finish. I hope it's wrong. But not wrong if it means wind from the north instead of rain. I'll take being soaked to the bone over a headwind any day. Yesterday was also an important day because Arsenal finished off their Champions League qualifier by soundly defeating FC Twente 4-0, for a 6-0 home and away aggregate. My brother texted me, wanting to know the score. When I responded, he wanted to know who scored. Not wanting to key in four European names on my phone, I called him to tell him. He said he couldn't watch the game, as if he were disappointed because some mundane commitment had taken precedent. I commented that it was really noisy on his end and asked if he were at the airport. "No," he responded, "I'm at Arthur Ashe Stadium." This is the same brother that last year told me he would love to have the money I spend on bikes and skis. My response was that I'd love to have the money he spends traveling to and attending sporting events. He has been to England and Spain to watch Arsenal play and beginning this year will be a season ticket holder to the Denver Broncos. I guess it's all just a matter of priorities. Yesterday was also an important day because I took my son fishing for the first time. Some friends have a pond that is stocked with bass and bluegill. I gave him the crappie (as in fish) pole, tied a fly to the end of the line, and told him to watch, and when a fish eats the fly, to pull it out of the water. 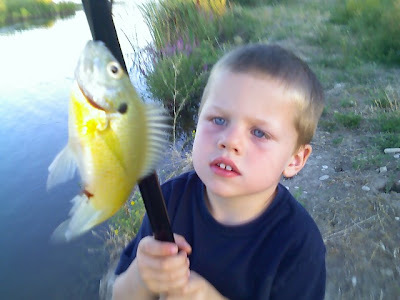 With very little assistance, he caught five bluegill. It was the best time either of us has had in months. It may not be true fly fishing, but it's immensely gratifying to take kids fishing and have them catch fish on dry flies. If our father had had his say, nobody who did not know how to catch a fish would be allowed to disgrace a fish by catching him....My brother Paul and I were left to assume that all first-rate fisherman on the Sea of Galilee were fly fisherman. And that John, the favorite, was a dry fly fisherman. Without new stuff, would there be any ambition? I heard a (fictional) story once about a guy who had started a company, taken it public, and with his fortune retired to a beach in Mexico. From time to time, he would visit a fisherman from whom he would purchase fresh fish. One day he asked the fisherman what he did each day. The answer: "each morning I take the boat out to fish, I come home and sell my fish, then in the afternoon and evening I sit on the beach with my wife and play my guitar." The fortunate man asked "why don't you buy a bigger boat?" "What do I need a bigger boat for?" the fisherman responded. "So you can catch more fish. If you catch more fish, you can make more money. And with that money you can buy more boats. Eventually you'll have a fleet of boats and a large fishing company, which you can then sell and retire." "What will I do when I retire?" the fisherman asked. "Whatever you want--what do you like to do now?" "I like to go fishing in the morning, and then when I'm done fishing, I like to sit on the beach with my wife and play my guitar." Some people are perfectly content with what they have, and others, regardless of what they have, always want more. I'm somewhere in-between. I'm perfectly content with the home I live in. Happy with my car, so long as it keeps running. Don't own what most would consider a "dream bike," but other than having a power meter, I can't think of any upgrades that I'm dying to have on any of them. Except maybe new tires on the single speed and the road bike. I love my skis and probably won't want a new pair until I finish reading the Powder Magazine gear guide sitting in my bathroom. As nearly content as I like to think I am, whenever I get something new, I can't wait to try it out. After about six months in my MTB shoes, I realized that they were simply never going to get comfortable because the shape of my foot and the shape of the shoe were just too different. So I took advantage of the wonderful REI satisfaction guarantee and returned them. And with the proceeds, went to my LBS and bought the MTB equivalent of my road shoes. I wasn't super happy with myself, because I had decided that as long as Specialized continued running ads featuring the doper Tom Boonen, I was not going to buy any of their products. But they are the only company that makes cycling shoes that I find comfortable, so my steely resolve didn't last very long. Of course this morning, I had to try them out. Rachel and I took the kids to the park, and they played while I made another attempt at the Sidewinder TT on my single speed. I was anxious to top the SS high water mark (one of only two SS attempts, mine being the other), since it was only eight seconds faster than my best time. I doubt the shoes made any difference, but, thanks to new shoes and Smartwool socks, my feet were comfortable. And I took 13 seconds off my time. Which means I have SS bragging rights until Shawn sees that I passed him and tries it again. In the process of riding 153 miles on Saturday, I probably burned about 7,000 calories. I consumed about 3,000 on the bike. I ate a small breakfast before the ride and then a normal dinner when I returned home. Yesterday I ate a pretty typical amount of food but probably didn't drink enough water. I weighed myself on Friday morning and weighed 162.4 pounds. This morning (Monday) I weighed 168.8. Weird. The last few weeks, I've felt as though I've been behind on my Lotoja mileage. Until Saturday, I had done a grand total of four rides over 100 miles all year. Last year I did that many in the month of July alone. Not wanting to bonk for lack of sufficient miles in my legs, on Saturday I took off for an epic road ride. I hoped to find some company, but for some reason it's tough to find people interested in spending pretty much their entire Saturday on the bike. Go figure. So about 7:30, I took off from home, intending to ride to Banks, then on to Lowman, Idaho City, and then back home. I was a little nervous about covering that many miles alone, so my wife and kids planned on meeting me about three hours into the ride to provide food and water and then follow during the lonely miles where if something went wrong, I'd be in a real spot of bother. I also threw a spare tire and chain in the back of the car, but in my haste to get out the door, forgot to toss a spare tube and the floor pump in the car. I wasn't too worried, though, as I always carry a spare tube and two CO2 canisters in my seat bag. Things went well for the first couple of hours, and by the time Rachel caught up with me, I was well ahead of where I planned to be. I stopped long enough to top off the bottles and grab some more food and was back on my way. We had stopped near a campground, so Rachel stayed there with the kids and let them play for a while before proceeding. Ordinarily I ride just to the left of the white line, as I've found forcing cars to move a little bit to go around me typically results in them giving me more space as they pass, not to mention it keeps my out of the garbage that's often on the far right side of the road. This ride was a little different, though, as the highway, especially near the white line, was really rough chip seal, but to the right of the line it was relatively smooth tarmac. About 65 miles into the ride, I was making my way up a moderate hill just above Big Falls when I heard something ricochet from under my tire into the guard rail. Instantly, my tire was flat. I pushed the bike to a pullout that was just ahead of me and took the tire off the rim. I was going to just throw a new tube in and not even think about it but decided to inspect the tire for glass or other debris just to make sure I didn't damage the new tube. Good thing I did, because there was a half inch cut in the tire. The tire was done, so I sat down and waited for Rachel to catch up with a new tire. At this point, I was also really wishing I had remembered the floor pump, but CO2 was going to have to do. I got the new tire on, only breaking one lever in the process. I aired it up and started back up the road. And "bang"--it was suddenly flat again. I had made the rookie mistake of not checking to make sure the tube was clear of the bead, and the tube had been pinched between the tire and the rim. With no extra tubes, the ride was over. I put the bike in the car and drove home. Since I couldn't really wait until next week to try again, I still wanted to get out and finish the ride, so once I repaired the tire for the second time, I headed back out and got my mileage via a different route. Taking a two hour break in the middle of the ride wasn't my first choice, not to mention I was looking forward to doing the climb from Lowman to More's Creek Summit, but I got my mileage in and I can go back and do the climb another day. The things I enjoyed the most were the wraps, the coke, honey stinger chews, and the homemade energy bars. Least enjoyable were the clif bar, stinger gel, and powerbar. Once again, I didn't feel like eating after about eight hours. I don't know if there's anything I can do about this. Although a cold coke sounded really good on the way home. Maybe I'll keep the cooler full of coke at Lotoja just in case. I'll admit this was not the most fun way to spend a Saturday, but it was an important training ride. If nothing else, I now feel ready and confident heading into Lotoja rather than apprehensive about the mileage. I may put in some hard efforts this week, but nothing too long. And I'll definitely be doing some group rides, because 152 miles with no protection from the wind really blows. As I mentioned earlier in the week, there's a good chance we'll be relocating, perhaps even to Dug's and Rick's neighborhood. In fact, with the way the job search is going so far, we'll either be relocating or starving to death, as there are very few jobs in Boise right now. Word is the local job market is only going to get more competitive, as my former employer is slated to announce another round of significant layoffs on Monday. Many folks are bracing themselves for the impending bloodbath. In the bizarre way that Wall Street operates, such news is welcomed and cause for the stock to rally. Meanwhile, my daily routine has actually become fairly predictable. I spend the morning scouring the web for job opportunities. Then I apply to those where I think I've got a legitimate shot, after which I go through my contacts to figure out whether someone in my network has a connection with the company and reach out to anyone I find who might be able to help. Usually around lunch time I go out for a ride. Then I come home and follow up on my leads. During today's search, I came across an opening that looked to be a good fit. So I looked up the company on the web to read more about them. I found that what they do is an even better fit than I realized. 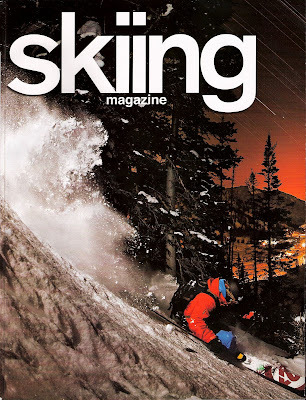 Then I went to the "careers" section of their sight, and featured prominently in the left sidebar was a photo of a skier with the title "12 inch rule." If you're a skier, you're probably giddy already, because you know what this means. Yep, anytime the local mountains have 12 inches or more of fresh (which is not exactly a rare occurrence in the Wasatch), everyone is free to go skiing instead of coming in to work. I'm still pinching myself dreaming about the possibility. I'm sure you could find it for yourself, but there is no way in the world I am posting the company name just on the outside possibility that someone reading this could pip the job from me. Not that it's mine to begin with, but one can hope. For quite a while now, chocolate milk has been my recovery drink of choice. I know I'm not alone in that preference, as Kenny and Kris, among others, also enjoy chocolate milk after a ride. I've always thought that if it works for Kenny, what with his ten Leadville belt buckles and all, then it's good enough for me. But if Kenny's results don't say enough, how about Kristin Armstrong? When she was "officially" welcomed back after her Olympic gold medal, she took a moment to thank her sponsors, including the Idaho Dairy Council who "provides me with my recovery drink--chocolate milk." Take that, milk haters. I got in the car this afternoon and, tired of the same old stories, decided to switch the radio from NPR to one of the music presets. The station was playing a song by Blues Traveler. After dropping some letters at the post office, I got back in the car, and this time they were playing the Dave Matthews Band. Which reminded me that years ago I saw Blues Traveler and Dave Matthews Band in concert. Together. It was a really terrific show. Which got me thinking about all the concerts that I have been to. There are many who have seen the same band more times than the sum total of all the concerts I have attended, but I've seen quite a few. And having only mentioned one on this blog, I thought I'd do a run down of a few of my favorites. First and foremost has to be U2. I've seen them four times, first in 1992 when four of us took a road trip from Salt Lake to Phoenix so we could see the Zoo TV tour at Sun Angel stadium in Tempe. I saw them again five years later at Rice Eccles Stadium in Salt Lake City, and once more five years after that at Notre Dame University. But the best U2 show was in 2005 at what is now Energy Solutions Arena. We had general admission tickets, and for this show there was an elliptical fore stage that allowed randomly selected concert goers inside the ellipse, mere feet from the band. Lucky for us, my friend Curtis had one of the random tickets, which meant everyone in his group got to go inside the ellipse. It was fantastic. The only disappointment was that there was a girl who was "selected" from the "audience" to go on-stage and dance with Bono during "Mysterious Ways." I found out when I watched video of the Chicago show that the same girl was selected at that show for the same task. I guess they wanted to make sure that the person was 1) safe and 2) could dance. The love for U2 in our family runs deep. My wife has been with me at two of the four shows. I made a CD of my favorite U2 songs that we listened to when taking my youngest home from the hospital, as I wanted to make sure that U2 was the first music she was exposed to. My older two children often ask me to sing them to sleep to "Running to Stand Still." Another favorite concert is quite a departure from U2, but it still ranks up there. A couple of years ago, Rachel and I went to see the Boise Philharmonic when they were performing Beethoven's 9th Symphony. I loved it. I wish I remember the name of the guy who came to sing with the philharmonic that night, because he was really good. It was good enough that when we got back out to the car, I put in a CD of the 9th, just because I wanted to listen to it one more time. I mentioned when talking about the RUSH concert that the best instrumental performances I have seen were Axle Rose playing piano and Tom Scholz on the organ. One of the most memorable songs I have seen was "Kashmir" at the Page Plant concert back in the mid 90's. They had the Heber Valley Symphony playing with them and went on for about 20 minutes. It was wonderful. Shows that were memorable because of their uniqueness include seeing The Origin at the now defunct Speedway Cafe, seeing the Gin Blossoms and Toad the Wet Sprocket play together at the Fairgrounds (and almost getting kicked out during the Gin Blossoms for crowd surfing), and being hot and filthy but still having a great time watching Alice in Chains play during Lolapalooza. After U2, the band I have seen the most is Oingo Boingo, having been to three of their shows, including their farewell tour. Oingo Boingo was also my first concert, at the ripe old age of 15. Actually, I take that back. Oingo Boingo is second to U2 in terms of paid concerts. But while in college, Curtis and I were effectively the roadies and lighting guys for a band called Randall Blithers. We helped them put on shows at Utah State and Snow College, were doing their special effects (incidentally, they were the only band doing special effects) when they won battle of the bands at the Wilk, and spent many, many weekends building stages, taking pictures, and whatever else needed to be done for the various shows around Utah County. We even hung around at the studio and pretended like we were producers or actually knew anything when they recorded their first (and only) album, which I still have, and which features my brother and some of his friends on the cover. We thought they really might be going somewhere when we helped them score a live spot on one of the popular morning shows to promote their album, but the guys in the band decided to do practical things like go to grad school instead of taking advantage of the one time in their lives when they could risk a couple of years to live the dream. Of course, no discussion of concerts would be complete without mention of the bad ones. Worst concert I have been to without question was Sting at Parkwest/Wolf Mountain/The Canyons/Whatever it was called at the time. He played for like an hour then walked off stage 'cuz he was cold. What a chump. I don't care if you are the biggest fan of The Police in the entire world--Sting is not The Police, and the concert still sucked. Put on a freakin' jacket, for crying out loud. Most of the concerts I have been to were in the 1990's. In fact, I have averaged about one per year during the current decade. Pathetic, I know, but it doesn't mean there aren't acts I still want to see. Top of the list has to be The White Stripes. In addition to being huge fans of their music, Rachel and I also feel an otherworldly connection to the White Stripes because Jack White has a major obsession with the number three and a minor one with the number seven, and Rachel and I are both the third of seven children and we have three kids ourselves. Weird, I know. But not as weird as having seven kids just to make it complete. We're not going there. How our parents did it remains a mystery. I'd also love to see Coldplay, especially since Viva la Vida is their best work yet. Concerts that would be cool just for the spectacle even though I wouldn't count myself as a huge fan of the music (or even a fan in any way shape or form in some cases) include Bruce Springsteen, the Rolling Stones, and Neil Diamond. Yeah, I know, Neil Diamond. But my parents have seen him a couple times, and from what I hear, the shows are really something else. If you've read all this and are still wondering why I didn't write about cycling today, it's because I hadn't ridden my bike for three days until this morning, and then I went out and tried to climb Bogus Basin road. I did alright for the first thirty minutes, made it to the sign in decent time, and then had absolutely no legs at all. I tried spinning for a while just to go easy the rest of the way to the top, but I realized my heart wasn't in it, so I didn't bother and turned around 1000 feet from the top. That Perpetuum is going into the rubbish bin. Give me Carbo Rocket, Gatorade, or Coca Cola. But Hammer nutrition is worthless. So even though the mercury reading is well over 100 degrees Fahrenheit today, summer is almost over. Leadville is over, Lotoja is just over two weeks away, school starts next week, and the EPL season is underway. Fall is pretty much here, and I am in no way ready for it. For starters, I don't have nearly the number of long rides that I did last year before Lotoja. Last year, I was doing a century pretty much every weekend in July and August. This year, all year, I have done exactly four rides of 100 miles or more. I'll do one more this weekend, but I'm getting dangerously close to the event and may not leave enough recovery time if I try to squeeze in too many hard efforts at the end. I also start coaching football (not the American kind) again this week. This presents a real dilemma, since there's a chance I'll be relocating in order to take a new job. Not really sure how to approach this one, whether I should just go about things business as usual unless something changes, or whether I should resign right now and have my assistant take over in order to avoid disruption. Adding to the complexity, I am coaching two teams this year for the first time, the U10 girls I have coached for the last four years, as well as my son's U5 team. This fall I also had high hopes of racing 'cross to see if that would keep me in shape before ski season starts. I was going to get a 'cross frame and swap over all the components from my commuter bike and then commute on the 'cross bike. Unfortunately, no job = no money, and no money = no 'cross frame. I could just throw some cross tires on my 29er and race on that, which may end up being the only viable option. Of course change, even when one is unprepared for it, is not a bad thing. There are a lot of really great reasons to love this time of year. For starters, it's harvest season. Our garden this year has been a complete bust, but farmers markets abound with some wonderful local produce this time of year, like these fingerling potatoes. I had no idea potatoes came in purple, and I live in Idaho. We also had some friends call and ask if we wanted to come pick some of their peaches. They had harvested all they could use and didn't want the rest to go to waste, so of course we were happy to help out. Rachel spent all day last Wednesday canning, freezing, and making jam from the peaches. I'm sure you'll be able to read about it on her blog shortly, but there's a certain feeling of contentedness that comes from having jam and fruit for the winter ahead. Of course having produce in the house also affords the opportunity to use it creatively. We had tomatoes from the farmers market and fresh peaches, so with a little onion, serrano, citrus, garlic, and chipotle added to the mix, I was able to make a delicious peach pico de gallo yesterday afternoon. Rachel commented that something is really good when I make a comment about how much I'm enjoying it after I've already eaten half the bowl. For the record, it was more like 1/3 of the bowl, not that I'm keeping track or anything. I also have to admit that as much as I am still enjoying riding my bike, I've actually started thinking about skiing again. And when I think about skiing, I get genuinely excited. I love floating through powder so deep it floats over my head. I love feeling like a complete and total ninny standing in the tram line at Snowbird, as if my 97mm waist skis are somehow inadequate for what they're about to be asked to do. I love feeling my lungs burn from the cold, thin mountain air. I even don't mind hearing the bro speak on the chairlift, even though I don't actually speak the language and resist using some of the words so critical to that vernacular. But the best part about skiing doesn't come at the top or bottom of a mechanized lift--it comes at the end of a steep boot pack or at the top of a long skin track. That feeling of complete and total detachment from all that is controlled and civilized in the world and total connection to something larger, more powerful, and more enduring than what man has conspired to build is the very best part. Standing at the top of a line that people riding lifts and descending groomers don't even know exists, quivering a bit with cold as the sweat from the hike up begins to evaporate and nerves from the imminent descent begin to build, and then dropping in--that is a feeling like nothing else in the world. It's rare in this world to hear people spontaneously shout for joy. Unless, that is, you're in the backcountry on a powder day. Do people actually believe this crap? And when I say "crap," I am of course referring to the advice that you give in Mountain Bike magazine. I know Mountain Bike used to be a standalone publication but now is a free supplement to everyone who subscribes to the only slightly more insightful sister publication, Bicycling. So it can't possibly be that good or it would have made it on its own. Regardless of the nature of the publication, when one is writing as a professional journalist, it's probably a good idea to ensure that what you have to say is at the very least accurate and preferably insightful. Several of your most recent articles are neither. For instance, in the most recent issue of Mountain Bike (they are not dated, presumably so that when they sit on the newsstand for eons, the unwitting dupes who actually pay for them are not put off by a shelf life that is longer than that of canned tuna fish), you indicate that "we get most of the water we consume from the foods we eat. Yup, even if you're drinking eight glasses of H2O every day, you're getting most of your hydration from food." Really. I know that kangaroo rats and lizards get nearly all of their water from the food they eat, but I am really struggling to figure out how there is more than a half gallon of water in a bowl of oatmeal with blueberries and soy milk, a sandwich, an apple, a handful of mixed nuts, a cookie, and a plate of pasta and meat sauce. It just doesn't add up--there's just not four pounds of water in that much food. But hey, if you tell me I'm getting most of my water from food, even when on the same day I eat the aforementioned items I may also go on a ride and drink a half gallon on the bike in addition to the half gallon I drink off the bike, I'll believe you. Because you're a credible publication, and I'm a newbie cyclist who doesn't know that much about these things. In the previous issue, you have a teaser on the cover touting "the tool that could save your life." Upon turning to the appropriate page, one finds a writeup about a torque wrench. Now I can understand that there would be some degree of pain and consternation over snapping a handlebar or breaking a carbon seatpost. In fact, I'll even concede that both of these could cause injury. But last I checked, I had never heard any instances of someone dying because his bottom bracket was too tight and seized up during a ride. So while torque wrenches are important, at least for those who insist on putting carbon bits on mountain bikes, it's a bit of a stretch to intimate that it could "save your life." Unless of course I was being attacked by the rabid editor of a sub-standard affinity magazine, and I used the tool to club him to death. In that case, it would have saved my life, but not yours. Finally, there in that selfsame issue, you did us all the service of debunking a very costly nutrition myth. In this case, all of us who have been drinking coca-cola during rides were warned about what nasty stuff that is because in a 170 pound cyclist, "the most he can absorb is 77 grams of carbs per hour....if you chug a 12 ounce bottle of coke, you just downed 39 grams of carbohydrates, which could set you up for massive gastric distress." OK, I majored in English, not math, so forgive me for struggling with this one, but how does consuming half the carbs that I can absorb in an hour set me up for "massive gastric distress?" What if I eat an energy bar that contains 50 grams of carbs--is that going to make me sick too? Is it the concentration of carbs? That doesn't seem right either, because there are 39 grams in a 12 ounce Coke, but a one ounce gel contains 25 grams, making it about eight times as concentrated. Is there anything I can eat that won't set me up for "massive gastric distress?" I really don't get it. Perhaps the nutritionist consulted for this article just doesn't think Coke is good for you. I won't argue that it is, but on a really long ride, at some point calories are calories and hydration is hydration, no matter what form it comes in. Sure some people are going to get an upset stomach from drinking a can of coke. Those people shouldn't drink it. But to other people, it could be the difference between finishing a ride and bonking. In fact, I remember several years ago when your publication interviewed four of the top cross country racers, and three of them mentioned in the interview how much they look forward to taking on a bottle full of Coke during the last lap. But perhaps they don't know what they're talking about. In fact, it was probably all the Cokes he drank that caused David Millar's chain to snap during the Giro this year. After all, Coke rots your teeth, so I'm sure it rots your chain as well. Don't get me wrong, Rodale Press, your publications are full of information. And in the case of Bicycling and Mountain Bike, I typically read most of it. But it would be really nice if you could step back and ask yourselves how high the information is going to register on the BS meter before it goes to press. In fact, as I've mentioned before, many of your headlines are somewhere between massive exaggerations and bald-faced lies, and I'm surprised that you can legally publish them. Just remember that, as readers, if we want the Weekly World News, we'll buy that. But when we want accurate, insightful information about bicycles and bicycling, it would be nice to have a place to go. The perfect solution would be to swap Style Man for Lennard Zinn and just read VeloNews. But that would be asking too much. Is there a component on the bicycle more important than the chain? Really, without a chain, you go nowhere. Sure, there are bikes that use belts or other drive mechanisms. But for mainstream cyclists, the chain is the difference between moving forward and spinning your legs but going nowhere. And a broken chain can mean the end of a ride, smashing your knee against your stem, or, in the case of Rick, Mike, or David Millar, shattering your dreams for a particular race result. If you've ridden long enough, you've had broken chains. I'm fortunate in that the only one I've had happened on a morning ride, relatively close to the trailhead, so all I had to do was push back to the car and drive in to work. I very nearly snapped a chain when I wasn't paying attention and shifted to a big/big combo during RAWROD. Fortunately in that situation, I figured out what was going on before I tried to turn the gear and was able to rescue things in time. Would not have been a good thing had the chain actually broken, but wouldn't have ended my day either, since, after breaking a chain, I started carrying a spare link just in case. But seeing what happened to Rick and Mike, I'm pondering whether to change my chain before Lotoja. Mike changed his and it broke, but I'll bet you dollars to donuts that it broke at the link where the chain pin was inserted. I'm assuming Rick was on an old chain, which I've got to think is much more likely to break. My current chain has about 2,000 miles on it. The chain that came with the bike was either a 105 or Ultegra--I don't remember which. After 1,000 miles, it was done. I replaced it with a Dura-Ace chain. After it had close to 1,000 miles on it, I ordered a new one. But every time I check it, it's not even showing 0.75% wear, so I'm still riding on it. I've got a new chain and two new tires waiting to be installed. And I keep waiting until the chain is worn enough to indicate replacement or one of the tires goes flat before replacing. Neither has happened yet. So if I go three more weeks and everything's the same, do I replace them anyway, or will I jinx myself? In other news, two things that I'd been waiting for and hoping for have finally happened. The first is that the bibs I ordered from Performance Bike finally arrived. I chose these bibs only because of the chamois, and it is exquisite. Is there any reason to choose one pair of shorts or bibs over another for any reason other than the chamois? Sure, some fabrics are more stretchy than others, but once they're on, they're on. I have never once actually thought about the fabric of my shorts during a ride. The one kind of funky thing about these bibs, though, is that they have one panel of gray fabric that extends from one leg, all the way up and around the back, and down the other. This panel of fabric is about 2 1/2 inches wide at the leg opening. Until I put them on, that is. Then it becomes 3 1/2 inches wide. Are there that many skinny-legged cyclists out there that they can't make a leg opening adequate for a proper quadricep? Thank goodness for stretchy pants, or I'd have to take these in for alteration. Actually, all my shorts are this way, it's just that these ones have one panel that's a different color, making it obvious how distended the fabric really is. The other bit of good news is that Kristin Armstrong won gold in Beijing. This is great for her and something she certainly deserves. With Cancellara also winning gold, and both doing so aboard Cervelos, I wonder if this spells an end to the era when, amongst triathletes, dentists, and pudgy accountants at least (is that redundant? ), Scott is the new Cervelo. One of the perks of unemployment is that I don't have to live by the traditional Monday - Friday, 8 - 5 workweek. Since I decided on Saturday to do the Mt. Harrison hill climb rather than doing a long training ride for Lotoja, yesterday I needed to get some long hours in on the bike. My original plan was to ride from my house to the top of Bogus, then on to Horseshoe Bend and Emmet before coming home. Would have worked out to about 130 miles. But Sunday night Brad called wanting to ride MTBs in the morning, so instead of climbing Bogus on the road bike, I rode up Bogus on the MTB and did Eastside and Sweet Connie instead. From there I pedaled home, changed shoes, filled up the bottles, and did the rest of the loop. Since Brad drove me from near his house to the Sweet Connie pullout, that cut about 10 miles out of my original plan, but I figured it was a wash given how much of the mileage was on the MTB. One of my objectives for this ride was to use Hammer Perpetuum as my primary nutrition source. 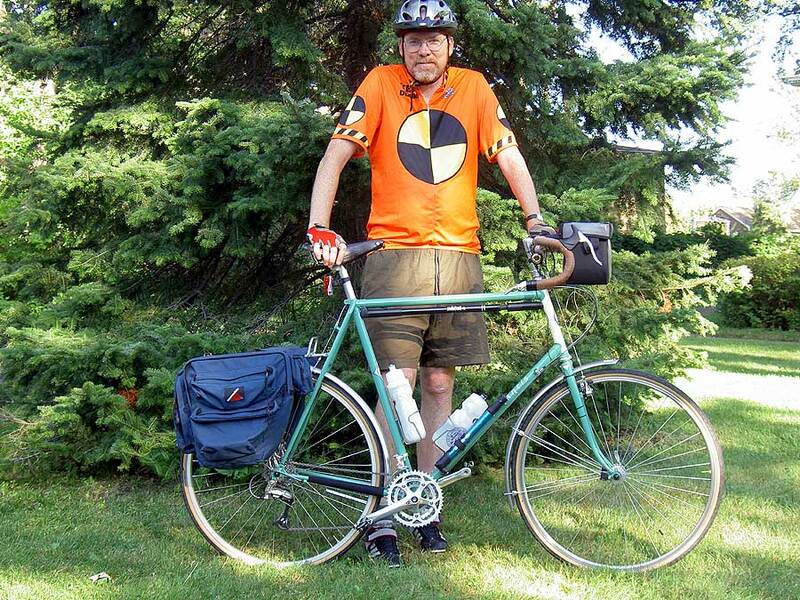 My brother, Steve, is sold on the program and used it to great success when we rode from Logan to Bear Lake last month. I've been using it on my longer rides since then, including Saturday at Mt. Harrison. It's worked well for rides from two to four hours, but I wanted to see how it worked for longer efforts. The MTB portion of yesterday's ride was about four hours of bike time by the time I got back home. I didn't eat for the first hour because I'd just had breakfast and then had two servings of Perpetuum and a hammer gel in the final three hours. I felt fine throughout, and when I got home downed a serving of Perpetuum before heading to Horseshoe Bend. I still felt good after five hours, but after six, I started feeling empty and week. I thought it was the stiff headwind while I rode along the river from Horseshoe Bend to Emmet, but even when I got out of the wind, I didn't feel good and couldn't get my heart rate up. In desperation, I stopped in Emmet and got a coke at a convenience store. That was enough to get me up the hill, but from there I just limped home, tired and sore. So the lesson here, for me at least, is that no matter what the sports nutrition product, I need some solid food during efforts of more than five or six hours. RAWROD was the same story, and I'm certainly glad to have learned this before the event, rather than going in assuming that what works for my brother will work for me. While he's still sucking down orange cream flavored Perpetuum, I'm going to have a turkey avocado wrap and maybe a cookie to help me get through Star Valley. Saturday was the Mt. Harrison Hill Climb. I have never entered a race that consisted of nothing more than a hill climb (other than my Sidewinder TT). It doesn't really play to my strengths, as it's just a long, steep climb. Before the race began, Eric was suggesting that I'd come to represent and mentioned my Sidewinder TT time (which doesn't look so impressive after the weekend). I told him I can do long rides, and I can do steep rides, but long and steep was not my thing. Either way, I was there, so I needed to pedal. Speaking of being there, I almost never made it. I didn't want to drive the 175 miles or so each way from Boise, so I searched around for some carpool partners, I thought to no avail. Then late Friday night, I got an email from Kai, indicating that his crew had room for one more. So I jumped in with them. It was interesting to me, as one who was riding just to see how I measure up, to ride out there and listen to the discussion of three guys who were there to win their group, if not the whole thing. Before the ride began, I bumped into an old friend and her family, who live in the area and were having breakfast at the restaurant where registration occurred. I hadn't seen them for about four years, so it was really nice to catch up. Given that the race started at 11:15 and we got there at 9:00, we actually had a fair bit of time to chat. These locals, who didn't see the sense in paying to climb a hill they can suffer on whenever they want, offered some valuable advice about how to approach the climb. I'd have liked to see Travis and Brek enter the fray, because I suspect they could have held their own. I, on the other hand, had a sense of foreboding like I was about to be owned. One of the first things I figured out was that this ride was going to be harder than I imagined. The course description indicated that it would be 16.9 miles with ~4500 vertical feet of elevation gain, topping out at an elevation of just over 9200 feet. What I didn't realize was that the first four miles were nearly flat, so almost all the climbing happens in about 12 miles. So it was going to be nothing like riding Bogus with a little tacked on at the end, as I had imagined--it would be much harder than that. As we got ready to start, of course there was the obligatory sizing up of the competition. The one racer that really stood out to me was the kid from Sun Valley who showed up with hairy legs and a full Rock Racing team kit. He was quite a spectacle. Turns out he was also really fast--more on that later. The race began with a neutral start. I knew from my warmup that the pace would be fast heading into the slight incline before the real climbing began. I told myself that I wasn't going to try and hold on to the group and go beyond my threshold doing so. So much for that plan. I finally let go when my heart rate passed 180 and my quads were searing. At which point I needed to back it off enough to recover and hope I didn't deplete precious reserves. There were a few that fell off the same time I did, so we formed our grupetto and kept grinding it out. I figured I'd do my typical climb--nothing fast, but consistent--and gradually pick off a few other riders as I made my way to the top. Turns out that I was able to pass exactly two other racers and got passed by one more. Not my best performance. Not much to say about the climb itself except that it was long. And Travis was exactly right--once you get above treeline, it gets really hard. He warned me about the steepness, but the thing that really killed me was the altitude. And pushing too hard at the start. This surprised me, as I usually don't struggle much with elevation. But above 8500 feet, I felt as if my energy was really low. I took a gel, but still had no snap in my legs. I eventually realized it was a lack of oxygen, not a lack of glycogen, that was holding me back. As I approached the top, the real contenders were already starting to descend. Turns out it was quite a race in front of me as Cody Peterson and Richard Feldman, both pros, were duking it out up front, along with the kid in the Rock Racing kit (yes him, hairy legs and all, can you believe it?). Cody took the win, with Richard coming in second. Behind them, Kai was alone for much of the climb before being caught by three others. He attacked at the line and took fourth and was first amongst Cat 3's--that may be enough for him to earn an upgrade to Cat 2. At the top, I chatted a bit with Brad, Eric, and Joellie before making my descent. Brad, as race organizer, had to stick around until everyone finished. He was making noises about next year imposing a time limit. I have no idea what time he finally came down. The descent was cold and windy at the top, enough to make me shiver a bit and make me feel nervous in a few stretches. OK, who am I kidding, I am almost always nervous descending on the road bike. I really don't get it, because I'm not at all that way on the MTB. But for some reason, I never feel completely comfortable with having nothing holding me to the road but two square inches of rubber. As I made my way down, I saw the rider who I'm pretty sure was the lanterne rouge for this race. He still probably won his category, though, as he looked to be at least 80 years old. He also weighed about a buck ten and looked like he was going to fall over at all times because he leaned so far to one side as he pedaled. But he was going to make it to the top. Pretty remarkable that when most of his contemporaries are sitting in rocking chairs and hospital beds waiting to die, he's pedaling his bike up a hill that I'm not in any hurry to return to. Once at the bottom, none of us wanted to wait around, so we jumped in the van and started the drive back. Just outside of Mountain Home, the van started surging like it was running out of gas. Except that it still had over half a tank. We pulled off the freeway, and it stalled completely, with just enough momentum to almost coast into a parking space at Jack in the Box. We tried to figure out what to do and how to get the rest of the way home. Nick went out to the parking lot, and I was telling Kai and Pete "if the van starts by some miracle..." my words trailed off as I watched Nick drive by the window. So we all jumped in and made our way home. Still no idea what really happened, but best guess is a vapor lock because of the heat. Overall a good race, but I doubt I'll be back next year. I don't need to drive three hours and pay a registration fee in order to be humiliated on a climb. I certainly am impressed with the guys who were at the front though--to do that climb in 1:11 is really moving. A little while ago, Smartwool sent me a couple pairs of cycling socks to try out. I've had a chance to try them and thought I'd do a little writeup. Before I do, though, I want to mention this morning's ride. Another guy named Mark, who lives in Utah, started tracking times up the Clark's trail in Draper. I've wanted to try it to see how I measured up but haven't gotten around to it yet. So I started my own Boise version: the Sidewinder TT. It's pretty simple, just start your watch where the Sidewinder spur comes off of Crestline, and stop it at the intersection with Trail 4. There's a sign at each of these locations in case you want to be that precise about it. When you're done, send me an email with your name, date of your attempt, and your time. If you want me to note that you were on a single speed, or a cross bike, or a recumbent, or whatever, I'll do that. Actually, I won't do that if you're on a recumbent, but if you do want to do it on a recumbent, let me know before your attempt so I can come watch. If you improve on a previous attempt, I'll move you up in the standings. I'd like to get as many local riders as possible doing this and see where it goes. I'll even work on getting some sponsors to throw in a prize or two so that the best time at the end of the season has more than just bragging rights. Oh, and if you're a club rider and want me to mention your affiliation, I can do that, too. Who knows, it may help with the whole sponsorship/prizes thing. Troy and I gave it a go this morning, with Troy on his cross bike and me on the 29er. I did it in 9:10 and Troy came in at 10:30. Brad and Steve were also riding with us, but didn't time trial it. I think had Brad ridden his XC bike, he would have smoked me. Which is why I didn't tell him when I invited him on the ride that we were going to TT sidewinder--I wanted to have a chance to be in first place for at least a day. Now back to the socks. 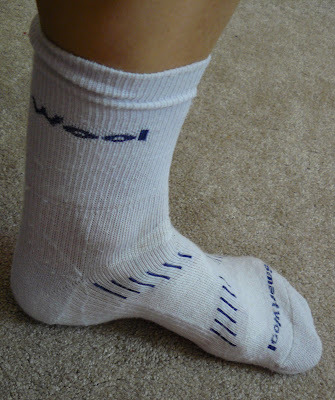 As I mentioned in my first post about socks, my favorite socks were a pair of Smartwools that have since been discontinued. Well the new socks they sent me, the PhD Cycling Ultralight Mini, as well as a similar pair that's yet to be released but is basically the same sock just a bit longer, I like every bit as much, but for different reasons. The old socks are great because they fit my feet without bunching, are thin enough to fit in my cycling shoes, and breathe nicely without getting soggy or even too stinky. The PhD's have many of the same qualities. They are thicker, but not uniformly so. The tops are quite thin, with a little more material under the balls of the feet and at the heels. While initially I was concerned about the added thickness, I think this is the secret to their best trait: they prevent hot spots. I have not been particularly happy with my Sidi MTB shoes because they have no padding in the insole and, relative to my road shoes, cause more hotspots and sore feet. These problems are virtually eliminated when I wear my new Smartwool socks. There's an X-shaped pattern over the instep that also seems to provide some relief from instep pressure. You can see the parallel blue stripes that are woven into this X-shaped pattern in the photo above--I have no idea if these stripes are ornamental or functional, but either way the socks are comfortable with no instep soreness, even after long rides. The prototype socks in the photo are a longer length, which for some reason I quite like. I've got other socks this length, and I'll probably buy more in the future. Are these socks perfect? Nearly. But if I'm picking at nits, here's a couple. First, the added thickness, while great for preventing hot spots, could eventually lead to numbness on really long rides when my feet tend to swell up (update: I wore these socks on a 120 mile ride with no numbness problems from swelling). If you don't have Fred Flintstone feet like me, this may be a non-issue. My only other gripe is the retail price: $13.95/pair. A little more than I want to pay for socks, but if it means comfortable feet on a long ride like RAWROD or Lotoja, then it's money well spent. When I was growing up, my family built a cabin at Bear Lake. Pretty much every weekend for an entire summer, we went up there and worked on the cabin. By the time it was finished, my brothers and I knew our way around the place pretty well, including how to "borrow" golf carts from the nearby golf course, and that by walking onto the second tee, we could play 8/9ths of a round of golf for free. As often as we were given a break from cutting, placing, and nailing logs for the cabin (in hindsight, it seems odd that these tasks were given to 10, 11, and 14 year old boys, but they were), we would go find some diversion. When this did not involve mischief at the golf course, we would usually walk the mile or so down the hill to the lake. On one such occasion, two of my brothers and I were walking back from the lake. As we were walking up the hill, one of my brothers dropped back a bit. This in no way raised suspicion at the time, but in light of recent revelations, should have been cause for concern. Literally the moment we got back to the cabin, our dad told us it was time to pile in the car and head back home. So we all jumped in the big family wagon. I don't think that all nine seats were full, as my older sisters were usually busy with important teenager stuff and thus did not participate in the weekly trips to Bear Lake. This meant that only one person had to sit in the "way back," in the rear-facing bench seat of the wagon. The brother who had fallen behind on the walk up the hill took this spot, and the rest of us were glad to let him have it. As we made our way home, from time to time a noxious smell would emanate from the rear of the car. This was followed by the whodunnit accusations and arguments, with blame falling nearly every time on the lone occupant of the rear of the vehicle. Once again, nothing atypical that would be any cause for concern--just a typical three-hour family drive. Perhaps more smelly and more frequent than normal, but he was somewhat notorious in our family, so we thought nothing of it. It's now been roughly 20 years since that trip home from Bear Lake, and just this last week certain heretofore unknown details were brought to my attention. You see, said brother came to visit us this week, and one evening we got talking and reminiscing. As it happens, the reason he dropped back on the walk up the hill was that he was in an urgent way and for all our knowledge of the area was left with nowhere to go or hide. And well, on the way up the hill, he sort of made a mess of himself. Then, when we got back to the cabin, he was informed it was time to go. And with my dad, when it's time to leave, it's time to leave. No arguing or lallygagging allowed. So he and his mess jumped in the car and made the long ride home. And the rest of us thought it was just gas. We got talking about my compact crankset and 11-26 cassette. His comment was that 34x26 was "pretty close to mountain bike gearing." I didn't argue, even though in actual fact it's still a long way off from the lowest gear in the middle ring of a MTB, and further still from the granny. The reality is that 34x26 is more than I need for riding around Boise. But I don't limit my rides to just Boise. Take last week for instance. From Tuesday until Saturday, I did about 18,000 feet of climbing. Tuesday and Thursday I rode Bogus Basin Road, Wednesday I rode to Hidden Springs and back, and then on Thursday afternoon we went to Utah. Friday morning I got up and rode over Suncrest and back. With all the times I've been to Utah with a bike, I had never actually ridden either Suncrest climb before. Dug and Rick live at Suncrest, so they've got to climb one side or the other pretty much anytime they do a road ride. And the Fat Cyclist chose to live in Alpine just so that he would be able to ride this once in each direction on his daily commute. I would probably take the long way home and ride around the mountain once or twice a week rather than face the north side of Suncrest five days a week. It's a sustained 10% grade for 1500 vertical feet. Climbing that hill is harder than anything we've got in Boise. I thought Suncrest was really painful and difficult until Saturday afternoon. On Saturday I took off from my parents' house in Sugarhouse, intent on riding to my sister's place at the mouth of American Fork canyon, with a detour to Snowbird along the way before climbing up the North side of Suncrest and on to Cedar Hills. The approach to Snowbird was miserable. It was 100 degrees outside, with a strong headwind. When I got to Wasatch Boulevard, the road was all torn up with that diamond pattern the road crews do when they're about to lay new asphalt. So I was effectively riding uphill, on cobbles, with a headwind, in 100 degree heat. Turns out that was the easy part. The climb to Snowbird leaves nowhere to hide. It's steep and never really flattens out until you get to White Pine, where it gets slightly easier for the final stretch before you get to Snowbird. I've never felt like I wanted or needed a triple on my road bike, but I would have taken one on Saturday. Even in 34x26, I was grinding along at about 60 RPM. So I guess the key to Suncrest is to ride Snowbird first. Because Suncrest frankly didn't feel that bad after what I had already done. While I was climbing and suffering in the heat, my brother was doing his own variety of suffering in the Tour of Park City. Or rather Tour de Park City. I hate it when American road races insist on using the French "de" instead of "of." I think we should all take to calling these races the "Tour day Georgia" and "Tour day Park City," like Bobke does, just to encourage the race organizers to get off their Euro high horse. You'd think when there's an organized road race going on that the idiots in cars would be fewer. Too bad that's not the case. Last year during Lotoja, my bro and I were called fa__ots, presumably for wearing our pink "win" jerseys. Not to be outdone, in the Tour day Park City, some redneck decided it would be cool to run someone off the road. One of these days a driver is going to mess with the wrong cyclist on the wrong day and get beaten and left on the side of the road, as has happened so many times when it's the car dishing out the beating. Until that day, I think anyone who fails to treat cyclists appropriately on the roadways should be required to commute by bicycle for a month. Even if they weren't converted by the end of the month, one hopes they'll be more respectful. My bro's take on the Tour day Park City, which he was using as a training ride for Lotoja, was that "Lotoja is good training for the Tour day Park City." Finally, I am still waiting for my bib shorts to arrive from Performance Bike (this link is only active in hopes that they check who's linking to their site and someone actually reads this). This wouldn't be such a big deal, except that I've now lost enough weight that I barely have any shorts that fit. This morning I sent a message to the Performance customer service department. Actually, I forwarded them the message I was sent telling me when my order was shipped and what the tracking number was. I complained very concisely about all the things I mentioned in yesterday's post. The response I got was a message telling me that my order had shipped on July 28 (wonder if they scrolled down on the message I sent them to find that out or if they actually looked it up in the computer) and that they needed to allow 7-10 days for delivery. Really. Tell me something I don't know. Tomorrow will be nine days and Friday will be ten. I'm kind of hoping that they don't arrive on Friday, that way I can call and demand that they send me replacement bibs overnight and then I'll keep the other ones as well when they finally arrive. OK, time to put down the crack pipe, because Performance would no sooner overnight me a pair of replacement bibs than one of their shipping clerks would work past 4:00 p.m. Losers. I don't know very many cyclists who have not made at least one purchase from Performance Bike. They're like the Wal-Mart of the bicycle industry, satisfying our collective thirst for cheap clothing and components. I'll admit that I order from them about once or twice a year. It usually takes me that long between orders before I'm ready to do it again. I love that I can get bib shorts from them for $60-70, when the same shorts would cost $120-140 at the LBS. If the LBS happened to have the shorts I wanted at all. This is the beginning and end of the love. I hate that they have a sliding scale for shipping charges, so the more you spend (and the more money they make on your order) the more they charge you for shipping. Why can't they be like backcountry, overstock, Zappos, or Amazon and either do cheap flat rate shipping or free shipping over a certain threshold? I hate that if you need to exchange something, you have to pay for shipping back to them, and then they will charge you for shipping yet again when they send out the new product. Moreover, returns are a total pain in general because they won't accept returns on anything that's been used at all. How am I supposed to know if something works or not unless I've used it? Neither backcountry nor REI cares how long I've been using something when I return it. Of course one could argue that neither backcountry nor REI is giving me the bib shorts deal I'm getting at Performance either, but I've had plenty of tremendous deals from steepandcheap (a backcountry affiliate) and REI/REI Outlet, and neither one would ever tell me they aren't honoring their return policy because I bought the item on sale. The biggest problem is that neither backcountry nor REI carries Louis Garneau bib shorts, otherwise I'd just buy from them and have no reason to rant. But you want to know the thing I hate most about Performance Bike? Of course you do--you're still reading. Well I'll tell you: it takes FOREVER for them to ship stuff. I am pretty sure that I could ride my bike faster from their warehouse to my house than it takes for my order to arrive. For instance, I placed an order a week ago Friday, and it's still not here. Had I placed that order from backcountry, it would have arrived the following Monday, Tuesday at the latest. It's taking longer for this order to arrive than if you do store pickup with REI and place your order the day after the weekly truck leaves the warehouse and have to wait an additional week for the next truck to depart. Is their shipping department allergic to working past 4:00 p.m.? Do they send things via carrier pigeon to the hub of whichever carrier will deliver the parcel? Is it going to show up in the back of a Bob trailer being pulled by some sweaty guy on a Rivendell? I really don't understand why it takes so long. Granted, I live in one of the more remote parts of the country, but this is still ridiculous. Whenever I'm meeting someone else for a ride, I start getting ready about 5-10 minutes before I actually need to start getting ready. Or rather, 5-10 minutes before I should actually need to start getting ready. This is because I am absentminded and will undoubtedly spend that last 5-10 minutes coming back into the house to retrieve something I should have had with me in the first place, whether it's my heart rate monitor strap, water bottles, or cell phone (I've only had to make the call of shame once, but I never ride without it just in case). So on Thursday afternoon, when we packed up to spend the weekend in Utah, I went through my mental list of things to bring several times. Realistically, this shouldn't be a mental list, but a real one, either laminated and hung prominently on the wall of my garage or tattooed to my forearm. But the list is still mental, which means it's prone to omissions. This time I forgot my floor pump. Since we were staying at my sister's house, it also meant no access to one. At my parents' or most of my other siblings', there's at least one cyclist in the house. I'm sure this will change for my sister and her family, living as they do right at the mouth of American Fork canyon, but for the time being, there are no cyclists resident. Which means no floor pumps. On Friday morning, I took off to ride over and back of Suncrest. I thought I'd be OK, since I'd just pumped up my tires on Thursday morning for a ride. I even theorized that since we had gone up in elevation going from Boise to Utah that the pressure in my tires would have been greater than they would have been at a constant elevation. Everything felt fine as I pedaled through Alpine, into Highland, and towards the hill. I got to the top and noticed there was quite a wind blowing. Those of you familiar with Suncrest know that the south side tops out at about an 8% grade, but the north side is a consistent 10% grade pretty much top to bottom. As I began my descent, I didn't like the wind, but I thought it would be OK. Then as my speed increased, a good gust hit me, and I got the wobbles. Could not keep the front end under control. It got so bad that I slowed all the way down and checked to see if my quick release was sufficiently tight. I tried descending again, but the wobbles soon returned. Then I remembered the tires. Between the wind and the under-inflated tire, I simply couldn't keep the bike from shaking. Of course, once the front end starts to shake, I get nervous, which does not help me to relax and just let the bike go. So I ended up riding the brakes pretty much all the way to the bottom. Thankfully on my descent of the South side, there was less wind and a flatter grade, so I made it back without incident. I wish there were some way I could buy my sister a floor pump for Christmas without it being obvious that the gift was really for me. I was grinding my way slowly up the north side of Suncrest Friday morning, dripping with sweat, ears about to bleed, a little chunk of vomit in the back of my throat while doing my best to hold the rest down. You were driving your black Subaru Outback, A/C comfortably blowing against your face as you coasted--not too much brake--down the hill. You recognized the pink Fat Cyclist jersey and waved. Not recognizing me beneath the helmet and sunglasses, you turned to look at my frame as you passed, trying to recognize rider by bike.